The global D-dimer testing market is fairly competitive and the intensity of competition is in all likelihood will intensify over the years. Transparency Market Research (TMR) notes that the constant influx of end users and the large number of acquisitions taking place in the market will raise the ante higher for several prominent diagnostics companies and niche suppliers. Top players operating in the D-dimer testing market include Thermo Fisher Scientific, Sysmex Corporation, Siemens Healthcare, Helena Biosciences, F. Hoffman-La Roche Ltd., Grifols, S.A., Becton, Dickinson and Company, Abbott Laboratories, Bio/Data Corporation, and Beckman Coulter, Inc.
TMR observes that top players are increasingly focusing on introducing technology-advanced, integrated hematology analyzers for D-dimer testing, in a move to gain a competitive edge over others. The global D-dimer testing market stood at US$ 1.9 billion in 2016 is anticipated to expand at a CAGR of more than 4.0% during the forecast period from 2017 to 2025. D-dimer tests are used for diagnosing conditions related broadly to deep vein thrombosis (DVT), pulmonary embolism, and disseminated intravascular coagulation (DIC). Among all the applications, the demand for the test for diagnosing DVT is prominent. The number of tests for DVT is poised to touch a mark of 86 million by 2025 end, globally. The popularity of the test stems from its cost-effectiveness and effectiveness in diagnosing symptoms of thrombotic episodes. Regionally, North America holds the sway in the global market garnering the dominant value in 2016. Vis-à-vis revenue, the regional market will retain its lead throughout the forecast period. A constantly swelling patient base, coupled with the marked awareness of the link between the risk of cardiovascular diseases and thrombotic episodes in patients, is fortifying uptake. 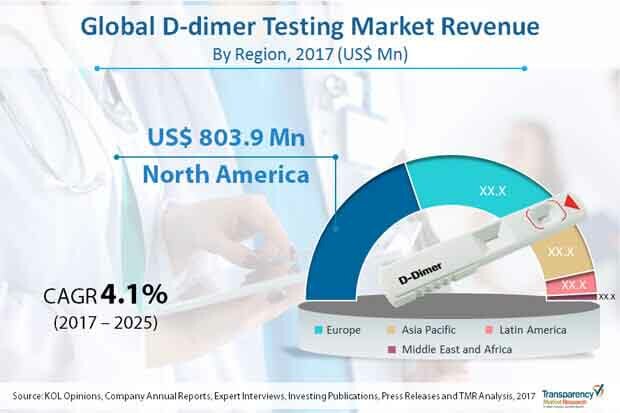 The global D-dimer testing market is driven primarily by the rising incidence of pulmonary embolism, deep vein thrombosis, and disseminated intravascular coagulation, for which D-dimer stands as the most popular initial diagnostic test. The high mortality of these conditions among patients in developed nations, is a notable factor bolstering the demand for D-dimer test. In this regard, is the high mortality rate associated with DVT in the U.S. The rising morbidity of serious blood clotting disorders and a number of conditions related to thrombotic episodes in worldwide populations is a crucial aspect catalyzing the demand for D-dimer test. The substantial number of D-dimer tests in lab settings, particularly in managing symptoms related with venous thromboembolism (VTE), is accentuating the growth of the market. The global demand for D-dimer tests is also getting a robust push from the rising uptake of these tests in the point-of-care (POC) settings. The rising adoption of D-dimer tests in hospitalized patients is also propelling the growth of the market. However, the lack of universal acceptability of these D-dimer tests in POC settings, mainly due to low bioequivalence compared to lab setting, is hindering the global market to reach its full potential. The market is facing a serious constraint in the application of D-dimer test in elderly populations. At times the insufficient interpretation of the test may lead to erroneous results, hence clinicians need to exercise caution. On the other hand, the global D-dimer testing market is witnessing surge in promising avenues owing to the advent of fully-automated coagulation analyzer using D-dimer tests. The adoption of automation has enhanced the efficacy of the instruments and the accuracy of measurements under D-dimer tests. In this context, the advent of highly sensitive hemostasis markers for these instruments augurs well for the market. Constant technology advances in the hemostasis markers have opened many an exciting avenues for market players. The high sensitivity of D-dimer testing in excluding VTE makes the test popular among clinicians. The study presented here is based on a report by Transparency Market Research (TMR) titled “D-dimer Testing Market (Testing Method - Point-of-Care Tests and Laboratory Tests (Coagulation Analyzers and Clinical Chemistry Analyzers); Application - Deep Vein Thrombosis, Pulmonary Embolism, and Disseminated Intravascular Coagulation) - Global Industry Analysis, Size, Share, Volume, Growth, Trends and Forecast, 2017–2025”. Extensive application of D-dimer test in diagnosing conditions related to pulmonary embolism, deep vein thrombosis, and disseminated intravascular coagulation accentuates the market’s growth. Constant technology advances in coagulation analyzers is expanding lucrative avenue for market players world over.